Emma and Grace cooked dinner for us tonight. They planned a menu yesterday, we shopped today and they cooked while Scott and I sipped wine on the porch and talked about where we want to live. They had written out the special requests we each had: macaroni and cheese for Grace, bread and tomatoes for Emma, fish and hot peppers for Dad, and peaches and avocado for Mom. I cheated a little, throwing out a salsa I like to go with the fish. They were in the kitchen for some time, chopping and creating, with Scott jumping in to help boil water for the pasta and sauté the halibut. Grace pretended to be the waitress, refilling our wine glasses, pouring pretend coffee and speaking with a formal British accent. The food choices and grocery shopping here in Spain have not been exactly as I imagined. I was envisioning a morning walk to the butcher, baker, farmer’s market. All fresh produce that smelled of the sun and the bread just baked. Well, in Colorado I shop at Safeway; here in Nerja, I shop at Super Sol! Super Sol compared to American grocery stores is small but has most of the same categories of food. The produce is seasonal and does smell and taste like the sun, at least the tomatoes and peaches! The girls have gotten used to the shelf-stable milk after trying three or four different brands. The fish has been fresh and good; the meat selection is lacking, though the chicken breasts have been great. No Kraft macaroni and cheese or Annie’s organic for that matter, but we didn’t count on finding Annie in Spain! There is macaroni and cheese in a can, kind of like Spaghetti Os, which we have not been desperate enough to try. (I have offered to make Georgina’s homemade recipe, which is being considered by Grace, who is quite a mac and cheese connoisseur.) The cereal selection is very limited and what they have is all of the fruit loops, choco-crisp variety. We have found frosted shredded wheats which have become a staple in less than two weeks. Wine, olive oil, dark chocolate and cheese are all in abundance and at much lower prices than in the US. Oh, and ham…..ham is everywhere! I was quite impressed with what the girls cooked up, and, like all good mothers, I ran in to grab my camera. (You know you’ve become your mom when you start taking pictures of the table set with food!) Their presentation was quite colorful and most everything was delicious, the tomatoes and Gruyere cheese, marinating in fizzy water, excepting. Here’s a picture of their handiwork! You can decide for yourself at their efforts and share your comments here with the girls! WOW, EMMA ! WOW, GRACE ! I can’t wait to come and visit and sample some of your gourmet delights. Yum, yum ! 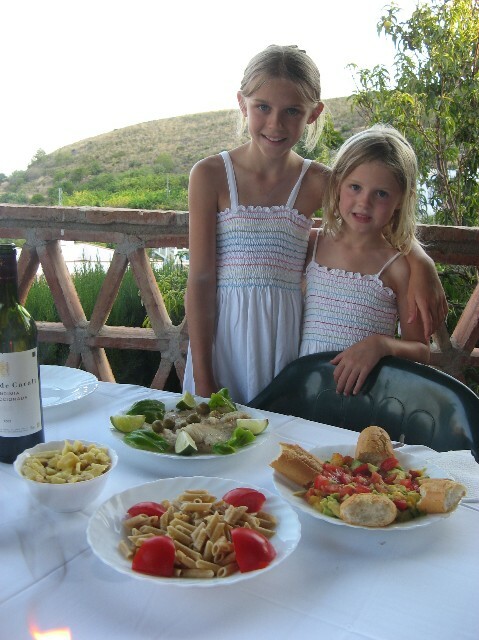 The photo looks like it belongs in Gourmet or Sunset magazine, especially with two cutie pies looking so sweet ! Sending you BIG, BIG hugs and sweet, sweet kisses!! Hi my little munchkin and poodie! I agree with Nana….your dinner looks absolutley fabulous. The picture could definately grace the cover of Food and Wine. I’m sooo missing all of you and love reading the blog and sharing a small piece of your days. You are so lucky to have this wonderful experience as a family and I’m thrilled you’re having lot’s of fun. I can’t wait to visit!Love you! Do you remember when you asked us if we wanted to watch “The Water Horse?” Well, when we got to our house here in Spain, Mom bought us “The Water Horse” movie! And we watched it! It was absolutely good! Hello Emma and Gracie Girl! Wow, the dinner looks wonderful. I am also loving the pictures. Nanny is here visiting. We are having fun, but we miss you. Last evening we visiting the horses across the fence. Baby Fitspatrick is getting big. Love to you. You are teaching your girls well Dee. What a fabulous spread, well done Emma and Grace. Looks yummy. I am taking notes….bring Annies mac and cheese….what else??!!! I can’t even cook that well – really. Looks so colorful, healthy and yummy. Oh…Jack and Daniel just woke up and are looking at the dinner picture now. Jack says the avocado, lime and fish dish looks soooo good! Tell Jack, Daniel and Alex we miss them and will miss camping this year with you all in the Colorado mountains! The girls promise to cook for them next time we’re together.